Yes, we had electric bass guitars that were used in bands with electric guitars and keyboards, but what about musicians that played together acoustically. Why not an acoustic bass? They first appeared in the 1950s and struggled on into the 1960s but without too much of a fanfare. 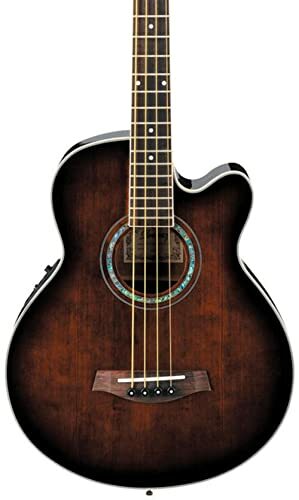 It was Ernie Ball, yes him of guitar string fame, who got together with a former Fender worker, George Fullerton, to produce the Earthwood acoustic bass. It didn’t last long but it was the forerunner of the instruments in use today. 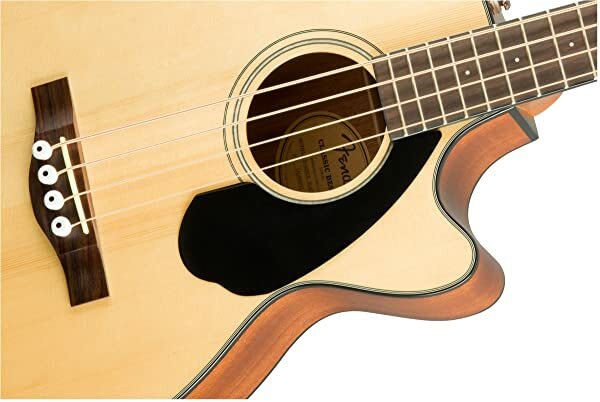 Buying An Acoustic Bass?…What Are The ‘Bass-Ics’ To Look For? 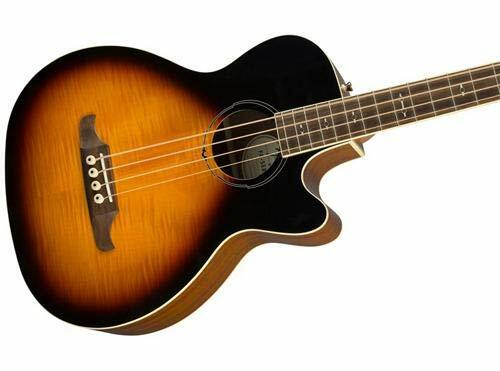 Why Buy An Acoustic Bass? Your Choice Should Be Driven By What You Plan To Use It For. Fender and bass guitars. You simply can’t think bass guitar without thinking of Fender. In 1951, Leo Fender gave the world arguably the greatest bass guitar ever in the Fender Precision and followed that up 9 years later with another great bass, the Jazz. Talk bass guitars, talk Fender. The 450CE is to the eye, not ‘Fenderish’. A large body, single cutaway, an acoustic shape that they call ‘new auditorium’, it lends itself to another world. It does though possess the Fender build quality and it has a mahogany back and sides with a three shade sunburst maple top, with some attractive cream binding. The fingerboard is made from Laurel and with the cutaway, has a twenty fret reach which is quite good. It is a typical Fender long scale neck. Fishman provide the pickup and electrics, it has volume, treble and bass controls situated on the top of the guitar for easy use. You can ask the question if this is an ‘acoustic’ bass why the pickup? Why not just dust off the old Precision if you want electric bass? Essentially it is amplified for the same reason acoustic guitars are, to give them a little more volume. With an acoustic bass however it needs electrics to be heard at all. Without amplification, it would soon be lost below the other guitars. 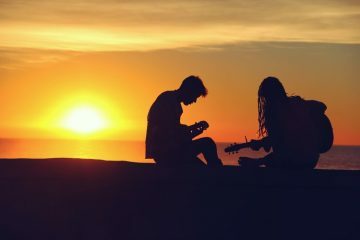 Acoustic basses are just not loud enough unless played with a very heavy motion of the fingers or when accompanying one guitarist who is using a light fingerpicking style. The reason you buy them is because the sound is unique. Very warm and rich and less ‘electrified’ making it a worthwhile instrument for any bass guitarist to own. This guitar has a nice tone and with its ‘C’ neck has a nice feel to it. The bass guitar is in the DNA of Fender so you can rely on this to be a quality instrument. It won’t sound like your Precision but it’s not supposed to, but it does sound like a good acoustic bass. Well constructed with good fittings. Will need its amplification to be heard at a decent level. You have to start somewhere and maybe learning to play bass on an acoustic is a good way to begin. But, this bass guitar though goes way beyond that, in terms of the quality that you might expect from a guitar termed as a ‘beginner’ instrument. It has mahogany back and sides and a solid spruce top, like so many of its 6-string cousins, and has a tapered easy to play neck with a rolled fingerboard. It is an attractive looking bass guitar. Unlike acoustic 6-string guitars which often take the basis of their overall tone from the top end, acoustic bass guitars cannot do that. Very often then in their natural state, they will all sound quite similar. Quality of string can make a small difference but it is the construction that will have the most impact. Orchestral basses and cellos take their voluminous sounds from the size of their body shape, it is this that generates the sound. You cannot have that with a bass on your lap or around your neck so other issues have to be maximized. Essentially what you have with all acoustic bass guitars is an acoustic 6-string with the bottom 4 strings an octave lower. That is never going to give you a big bass sound or even enough volume to be clearly heard. We are therefore relying a bit on amplification and with this guitar, good use is made of the Fishman pickup and preamp. It has bass and treble controls with a volume and gives a neat sound. It also has a built-in tuner with LED display. This is a good bass guitar that plays well and is better than its label of being a beginner instrument. Well made and is attractive to the eye. Delivers a simple but nice tone. Rather quiet when used with no amplification. 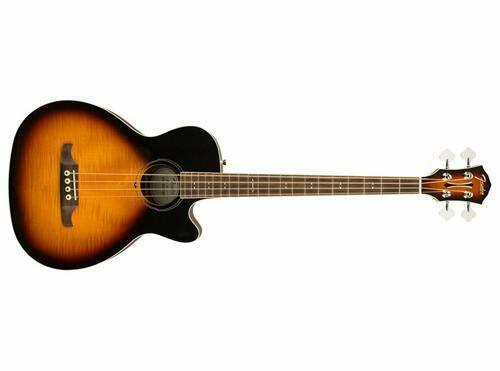 Taylor has added an Acoustic-Electric bass to their GS range. It’s constructed from layered Sapele wood for the sides and the back with a top made from Sitka Spruce. It also has a Sapele neck and an ebony fingerboard. It has a scale length of 23 and a half inches essentially making it a small scale bass, but they have decided not to have a cutaway to allow full access to the fingerboard. It’s, therefore, a very compact and easy bass to handle and extremely light. In many ways, you could also include ’travel bass guitar’ to its description. With a reputed manufacturer, you would expect quality and this bass is beautifully made from good materials but it also sounds nice giving natural bass sounds. There is a resonance to the notes which is impressive given the relatively small body size. What has been achieved with the natural sound is to create something a little different. Amplified sound is delivered by an ES-B electronics preamp giving you a basic tone control and a volume situated on the top of the guitar for easy use. It also comes with a built-in tuner. It is made in Mexico and unlike many of its competitors comes with a soft case. With Taylor guitars you know you will get a special instrument and this bass is no different. Easy to play, a nice resonant sound with impressive deep notes, it delivers on all fronts. It is though, not cheap, but then Taylor does not make cheap guitars. Certainly worth considering if you are looking for a quality instrument. Easy to play and lightweight. Very nice acoustic bass sound. Well made with good materials. Price will put some people off. 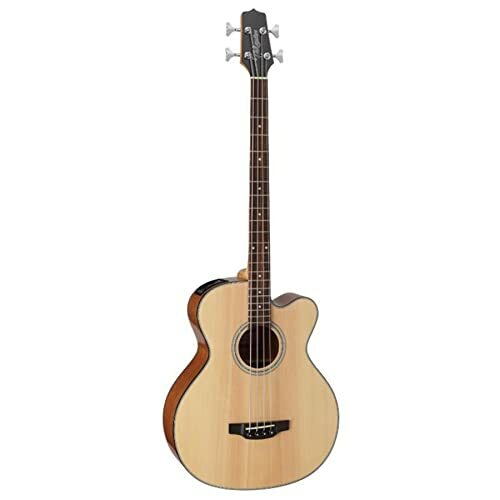 Takamine makes quality 6-string guitars so it is interesting to see how well they produce an Acoustic-Electric bass guitar. They have gone for tried and trusted choices for the manufacture, the back and sides being mahogany with a solid spruce top. A combination that is likely to yield good results. The cutaway is deep and allows full access to the rosewood fingerboard. The neck itself is mahogany. All well and good having quality materials but what about the build? As you would expect from a respected guitar manufacturer, it is very good. Put quite simply everything fits, and fits well. Considering it does not have a voluminous body size the resonance of the deep frequencies is impressive but doesn’t cloud the twang at the top end. Electrics are provided by the excellent TK-40B preamp. This gives you volume control, mid-shift and bass boost controls and a three-band EQ., with a bypass switch. The controls are located conveniently on the top edge. You cannot fail to be impressed with this instrument and the inclusion of pearl dot fingerboard inlays and a synthetic bone nut and bridge saddle demonstrate the effort that has been put into making a quality instrument. On occasion, we have come across bass guitars that struggle with their tuners but this has some tough and accurate hardware. This is a classy instrument though it is quite quiet when played acoustically, but then that applies to most of them. When amplified it has a good sound which has that ‘acoustic bass; feel to it. Placed in the right environment this bass guitar would be hard to beat, but it is quite expensive. I suppose it’s a question of you get what you pay for. Well made and looks good. Creates good resonant bass sounds. Easy to play and control. As you look closely at this bass guitar it gives the impression it has been made for a very niche market. We’ll explain why shortly. Gold Tone might not be the first name you think of when you think Bass Guitar but they have produced an instrument with the Mbass-25 that is worth having a look at. They have used the dreadnought style from the ‘6-string’ medium and constructed the guitar around that style. The advantage being the deepness of the body shape which will add a natural resonance. They have added an interesting cutaway that sits almost at right angles to the body shape that gives access to the high frets. You need that access because this is a short scale bass guitar, with twenty-five and half inch scale. Going back to my earlier point about a niche market. In some quarters of the ‘bass-playing’ fraternity, there is a certain snobbishness about short scale instruments. Some saying they are not really a bass guitar. There have been many great players, Andy Fraser and Jack Bruce for example who have used a short scale at times. Short scale basses have their place. It is a very niche community you either appreciate them or not. One thing they do offer is ease of playing style either for beginners or even pro’s who want to try things not possible for the average mortal on a long scale. The build of this instrument is high quality and the die-cast tuners are themselves quality machine heads that are accurate and strong. Now, let’s get radical. Silicon rubber strings? Let me just say it again for those of little faith…silicone rubber strings. They are not a new idea, they have been used before with Fender (of course) doing a lot of the early work with the body to carry them. They do offer something totally different soundwise. In case you have never tried them they are loud, huge bottom end considering its acoustic, and they bend like crazy.Not for everyone we might add. The electrics have an active piezo pickup with volume, bass and treble controls and an onboard tuner. If you haven’t had a look, be our guest. You might get a surprise. Well built with good materials. Quite loud before amplification with good bottom end. Rubber strings make it hard to tune and won’t be to everyone’s taste. 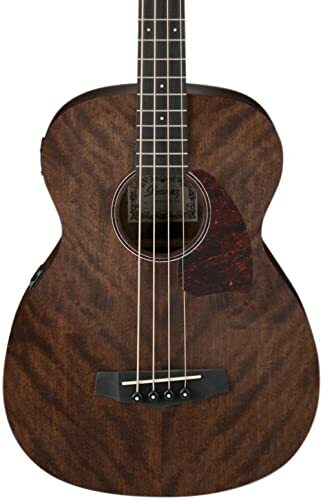 This Acoustic Electric bass is part of the BCP catalog of instruments, is made by Sky Enterprises and is positioned at the premium end of the pricing scale. The body, top, back, neck and sides are made from mahogany. It has chrome die-cast tuners and is finished in a glossy black or blue finish with tasteful decor around the soundhole. The preamp has controls for bass, middle and treble as sliders and volume control and interestingly, presence. 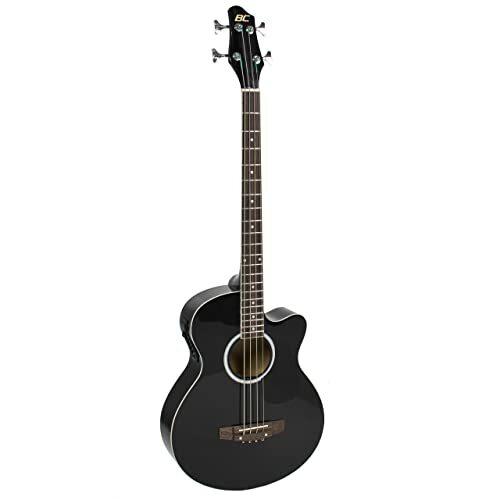 Unlike many other acoustic bass guitars, this model comes with a truss rod. The controls are situated conveniently on the top edge of the body. Having identified that it looks really nice, how does it play? Surprisingly well. We say surprisingly because at this price you don’t expect too much from a guitar. The action is smooth and easy to play and with the addition of the truss rod very adjustable to suit taste. There is little or no fret buzz even coming up the scale, and the neck was comfortable. When played acoustically it had a surprising definition and was quite audible and when amplified there was enough control from the onboard EQ etc to get a decent sound. It cannot compete with the top models that are vastly more expensive, you wouldn’t expect it to, but it does represent huge value for money. Ideal for a learner or child for their first bass? Definitely. Well made with a nice finish. Some may not consider it suitable for live work. 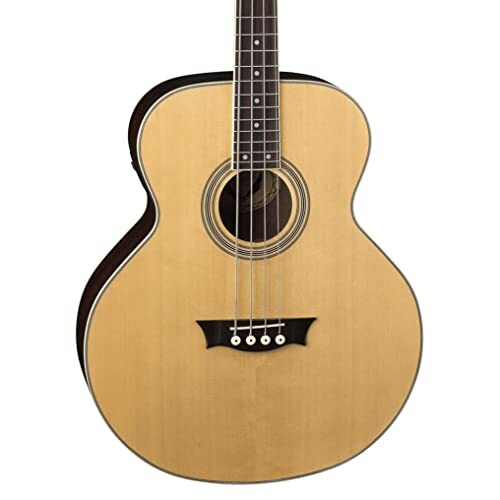 Ibanez are renowned for producing quality guitars and this acoustic bass is no exception. The back and sides are mahogany and so is the top. It has a maple neck and rosewood fingerboard with 20 frets. There is no cutaway for access to the full fingerboard. The neck is quite thin so if you are used to playing a full-size electric bass guitar you will need to adjust a little. It is designed to a Grand Concert body size which if you are unfamiliar with that, is a little bigger than a dreadnought. The tuners are made from die-cast chrome. The electrics consist of an under saddle Ibanez pick up and an Ibanez preamp which offers bass and treble controls, a volume and an onboard tuner. On first glance, it does not seem the most attractive of guitars visually. The depth of color of the mahogany does make it a little dour in its appearance, but that is a side issue. The important things are how is to play and what does it sound like. The design of the body makes it a comfortable guitar to play sitting down, always an important feature to recognize with acoustic instruments. Sound wise it is very nice. The mahogany construction delivers a warm, resonant sound that is nicely balanced across the frequencies. It is possibly a little louder acoustically than some of its competitors due to its body shape. Plugging it in does not detract from the warmth of the tone and the electrics work well. Tone controls offer adjustments to the basic sound to suit what you want. Set in the mid-price range it is a good guitar and certainly worthy of serious consideration. Easy to play, comfortable to hold. Looks visually a little dark and dour. Here we have a very interesting bass guitar to look at, with some different features. The construction is standard almost jumbo style, having mahogany sides and back and a solid spruce top. The body is finished in an attractive tobacco sunburst. It has a single cutaway giving access up the 22 fret fingerboard. Electrics are supplied by an AB4-T preamp with controls for treble, bass and middle and also a presence. Sound adjustment options then are many. There is also a useful onboard tuner and a phase switch to control any potential feedback on a stage. There is one issue with acoustic basses that cannot be ignored and that is the volume in the unamplified state. It’s going to be quiet and there isn’t much you can do about it. Orchestral double basses are big for a reason. An acoustic bass is likely to get lost behind even one guitar even if it is being fingerpicked fairly lightly. It has no chance of competing with a drummer, even a quiet one. An attempt has been made with this guitar to alleviate the problem in acoustic mode. Two sound holes have been included, one on the top edge and one on the flat top surface. The idea is to give the user a little bit more acoustic volume. It is a novel idea. Whether it works or not is down to individual choice and circumstances, but at least there has been an attempt made to solve an age-old problem. It does not come cheap though so make sure you are sitting down when you check the price. Jumbo size may make it awkward to play and handle. Another quality Ibanez to have a look at. They do make very visually attractive instruments. This bass guitar is a full-sized body that will give big rich tones with a very warm sound. The neck is a 32-inch scale, not easy for some to play but which adds to the tonal quality. Mahogany has been used for the back and sides and the neck and it has a resonant spruce top with rosewood fretboard and bridge. The fingerboard has pearl dot inlays. The finish, which they call dark Violin Sunburst’ is quite stunning and if you were to pass it in a store you’d have to look. As we are beginning to realize, electrics on acoustic basses are very important and here they are provided by a Fishman Sonicore pickup and an SST Shape Shifter preamp. The preamp has the usual controls for managing the sound and has an onboard tuner. Ok, it looks very pretty and has all the bits you need but how does it sound? Very good is the answer. Warm, rich tones dominate the sound and the balance of the frequency range is excellent. No fret buzz and a solid feel to the neck add to the experience of playing a quality acoustic bass guitar. When amplified it keeps its natural resonance and doesn’t overkill at the bottom end as some do. If you are looking for an acoustic-electric bass you need to have a close look at this one. Priced mid-range, it is excellent value. Well made with quality materials. Full-size may be difficult for some. This is a big guitar and with it a big sound. Made from the almost standard mahogany body and spruce top, it continues with formality by presenting a mahogany ‘c’ shape neck with rosewood fingerboard. The fingerboard has pearl dot inlays and is a 34-inch scale neck. It has a dual action truss rod for the extra stability of adjustment. For electrics, Dean has included a piezo pickup in the bridge and their own passive preamp with volume and tone controls. The bridge is made of rosewood. The tuners are chrome die-cast and are sturdy but easy to use. It doesn’t have a cutaway so if you need to play high it might be a little awkward. The construction is completed by some nice multi-ply binding and a soundhole inlay. It has a quality and richness to it, that is generated by the body size, that is pleasing to the ear. 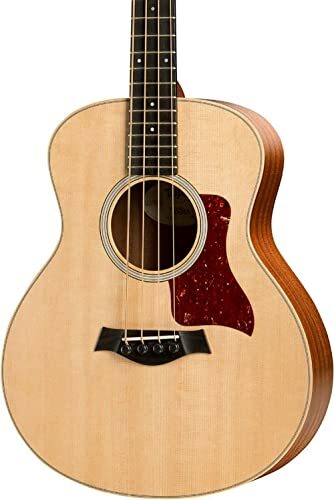 Like all acoustic basses it requires its amplification to be heard but when played acoustically, maybe with one other guitar, the sound is audible. When it is amplified it maintains its overall sound and comes into its own somewhat. The bottom end really pulsates but doesn’t overpower the mids and top end. It plays easily though the size will undoubtedly make it difficult for some. This does need to be borne in mind as this is a big guitar. Price wise it sits about in the middle and offers a quality instrument at a competitive price. Well made good looking bass guitar. Quite a big instrument that may be difficult for some. Well, firstly why are you buying it. Is it for yourself or maybe someone else to learn bass guitar, maybe it’s for playing quietly at home or for fun with a friend or two? Or are there loftier performance ambitions? The first thing we must emphasize again is that acoustic-electric bass guitars cannot realistically be used live without amplification. They just do not have the body size to generate the volume needed especially for the lower frequencies. Thicker strings and other issues all go to reducing the potential acoustic output. So, if you have to use amplification, why not just buy an electric bass? Because they are unique and so is the sound. They manage sounds and feel that an electric bass could not aspire to. It might have four strings but it’s a totally different beast. Their practical uses are maybe a little limited if we are talking live shows. If you are going to take it on stage and plug it into 400 watts of growling Marshall bass amp and play it through half a dozen effects pedals it really isn’t going to work. If you’re going to plug it into a more tone sensitive amp and play with a jazz band, a folk group, maybe a lounge bar trio or with Paul Simon, you get what we mean, it will come into its own. Aside from the stage work, we think it’s just nice for a bass player to have one at home. 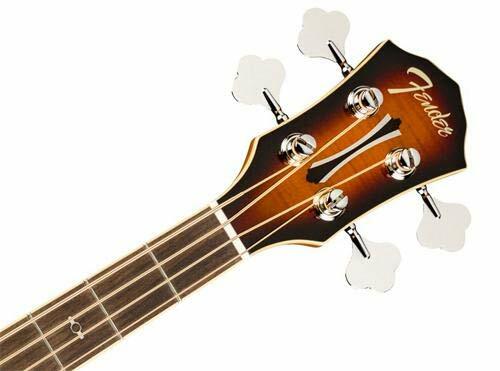 Whatever the reasons for owning an acoustic bass there are some great instruments around to choose from. We have reviewed some of the best available. They cross a fairly wide range price wise and all have their own plus points. Some smaller are very playable, some of the larger guitars harder to play and manage but with a great sound. One or two have some different ideas incorporated in their design, others very traditional. In undertaking this review the one matter we are surprised about, though I suppose we shouldn’t be, is the quality of the build of these bass guitars. There are of course some serious manufacturers we’ve looked at but all of them are well made with quality materials. Further, without being ostentatious, there are some very attractive looking instruments. Just to remind the reader one more time, when choosing, take a good look at the electrics of each guitar, what they can do and offer your sound. It’s going to be important as its likely you will be plugging it in. You need them to be as good as you can reasonably get. Great to play, good electrics, beautifully designed and made, it is a stunning guitar.